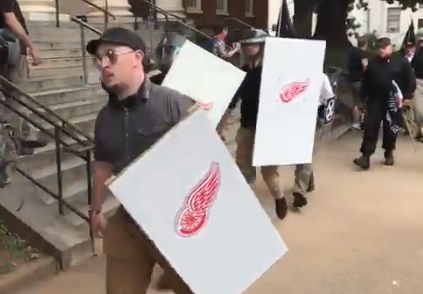 White nationalists carried shields emblazoned with the Red Wings logo. The video, first posted on Twitter at 9:38 a.m. by an NBC News producer, shows a group of white nationalists chanting “blood and soil” as they headed to a protest over a plan to remove a statue of a Confederate general in Charlottesville. About two hours later, the governor declared a state of emergency after white nationalists and neo-Nazis, some carrying guns and others wearing helmets, clashed with counter-protesters. The white nationalist group reportedly calls itself the “Detroit Red Wings” – with a motto “Rust Reforged” – and is opposed to immigration. On Friday afternoon, white nationalists marched in Charlottesville with torches and chanted, “White lives matter” and “You will not replace us.” They encircled a group of counter-protesters, prompting fights to break out. But let’s call it what it was – a white race riot.